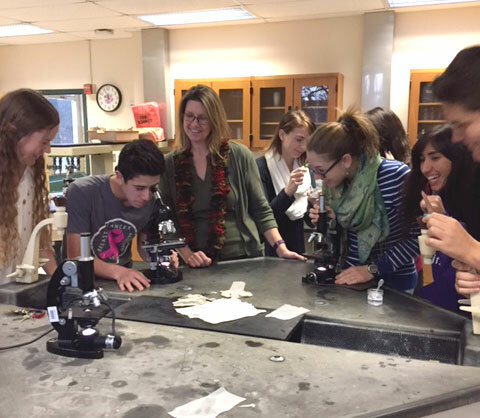 Lisa Reece, a Warwick Valley High School science teacher, has been selected as a New York State Master Teacher. Mrs. Reece will join the statewide network of more than 600 outstanding secondary school science, technology, engineering and math (STEM) teachers selected to this program since its inception in 2013. She also becomes the third Master Teacher in the Warwick Valley Central School District – joining middle school science teacher Tracey Waters and high school math teacher Lisa Howard, who were previously selected to the program. “I’m very excited about this new opportunity and looking forward to collaborating with like-minded teachers to deepen my content knowledge and enhance STEM education in Warwick,” Mrs. Reece said. She currently teaches Living Environment and Science Research. The NYS Master Teacher Program recognizes and brings together some of the most motivated and highest-performing STEM teachers. Selected participants collaborate over the course of a four-year program to develop expertise in the areas of content, pedagogy, and students’ families and communities. In addition to peer-mentoring, Master Teachers also inspire and help support the next generation of STEM teachers. The program rewards participants with an annual stipend of $15,000 over four years. In 2014, Mrs. Reece was also among a select group of educators to participate in a fully-funded, weeklong STEM program sponsored by the Siemens Foundation. She was featured in the February 2014 issue of Hudson Valley Magazine for this accomplishment.